The elevated section in A2 appears to strike the right balance. The junction station is oriented north/south on 41st just south of Alaska, a few blocks away from the junction but a more in the center of the density in the area. This looks like the best location for a station but we would want to see station entrances on either side of Alaska for direct bus transfers. The location of Delridge station also looks to be ideal for direct bus transfers. A1 presents three tunnel options, presumably all requiring around $700M in additional funding. We would have liked to see them narrow that down, presenting the option to the West of the Junction, in particular, seems like a waste of effort. If regional planners and politicians are looking for a way to spend $700M on transit, we would like to officially submit that this tunnel is a remarkably poor choice that does nothing to improve transit speed, reliability, or experience for riders. Despite a vague pro-transit preamble, the Port has a pretty clear message in their ST3 letter: Don’t put transit near us. A SODO station moved to the west was the one thing that would have improved transit for riders in this segment. The Port killed that option with claims of impacts to Occidental: A road that was empty even on fish truck day. Unless something changes, riders in the industrial business district that includes Starbucks headquarters are just out of luck. A2 also appears to get the Massachusetts tunnel connection between Stadium and ID Station right. This is an affordable option that allows Metro to continue to operate Ryerson base. A shallow station on 5th, the affordable option that is clearly best for transit riders. This station needs to be built with fast Link to Link transfers as the primary focus but should also include better connections to Sounder/Amtrak. This is an opportunity to give riders a much better experience at our biggest transit hub, let’s take it. Mitigation for businesses in the ID when we build a shallow station on 5th. Mitigation should come both in the form of how the station is constructed and financial help during construction. Of all of the stakeholders talking about impacts, their concerns ring the most true to us. A cut and cover station will be disruptive and we need to make sure the small businesses in the area are put in a position to weather those impacts. A1 appears to get this right. General alignment on 5th allows for enables the best transfer environment at Westlake station. Denny station oriented South of Denny with an implied entrance on the north side. SLU station straddling Aurora at Harrison for the best possible transfer environment and largest walkshed. We preferred a Seattle Center station oriented further South to bring parts of North Belltown into the walkshed, but the logic of the chosen location that maximizes the walkshed within Lower Queen Anne makes a lot of sense. As we’ve mentioned several times before, this segment has to be built for future expandability to the north and east. Building a brand new rail tunnel and not future proofing it would be a historic error. A2 is the best option presented for this segment but still needs some work. Smith Cove station is located between Expedia and the Cruise Terminal. The year-round demand is actually at the Helix Bridge entrance to Expedia’s new and growing campus. Whether A1 and A2 station is chosen, it needs to be designed to connect directly to the Helix Bridge to leverage the existing access point and connect to bus transfers on Elliot Avenue. There appears to be consensus between alternatives that Interbay station will be at Thorndyke but the station should be moved closer to Dravus Street for bus connectivity. For both stations and alternatives, we’ve asked Sound Transit to clarify that “surface” segments mean no grade crossings of any kind. We’re frustrated with the options presented here. There are lots of options on 14th, a location that is only lovable for being out of the way. A truly terrible metric for a subway stop. Seattle Subway and Seattle Transit Blog are in full agreement on this point. The affordable/elevated option presented in A2 sticks to 14th rather than cutting back to 15th where the station can connect to riders far better. If there is budget available, the best alternative presented here is in A1 which has a tunnel crossing at 14th Ave on the south side of the Ship Canal with a station at 15th Ave NW in Ballard. We want to see a preferred alternative that includes an affordable option we can support. None were presented here. One of the eternal issues with public process is that it’s usually people who oppose or are ambivalent about the project who get the biggest voice in the outcome. To quote Martin’s recent post “As usual, no stakeholder is primarily interested in the convenience of future riders.” That leaves only the community of pro-transit citizens and activists to give future riders a voice. We need your help. The final decision is with the Sound Transit Board. Please join us and contact them at emailtheboard@soundtransit.org and let them know: Make transit riders your first and last consideration when developing the preferred alternative. I did contact the Board. My feedback: The representative alignment with the A2 station location in the Junction is just fine. A tunnel is of marginal utility in Ballard, and none at all in the Junction. The representative alignment is cheaper, and just as good functionally except in the fevered minds of those who believe tall-masted sailing ships are about to make a comeback. We want to see a preferred alternative that includes an affordable option we can support. None were presented here. At this stage we’re hoping to bid farewell to the RA. It was a good place to start, but doesn’t have any features that are worth preserving. Yeah, other than providing an affordable alternative we can support. No offense, but there is an obvious disconnect there. You rightly decry all the stupid changes or the expensive ones, while ignoring that the representative alignment was simply better. It has a station at 15th and Market, closer to the surface than a tunnel. It has a station at Dravus. It has a station close to the Helix at Smith Cove as well. The only improvements to the RA are minor and obvious, and bound to happen eventually, as we get into the fine details. Overall, the representative alignment is simply better, yet you dismiss it. Apart from fhe 15th station, what is better about the RA? As we pointed out in our earlier post, a mixture of improvements are affordable. So what parts of the RA are better for transit riders? The 15th station and the Interbay station are much better. That is really the point. Some of the changes on some of the other proposals are just a tiny bit better. But overall, the RA is much better because it avoids throwing away the Ballard station. I’m all for tweaking the RA a little bit here and there, but it should be the starting point (not either alternative) because it is better overall. Tens of thousands of people agitated to get Link to Ballard as the largest urban village that wasn’t on Link. A 14th Avenue station is a worst-case scenaro that can barely be said to serve Ballard at all. 14th Avenue is effectively three blocks from even 15th, which is already the edge of the village. The combined time of riding+walking won’t be much better than the Ballard Streetcar proposal. It was the Ballard movement that got ST to accelerate ST3 in the first place, and this is what we get? Smith Cove: The Yellow alternative looks roughly the same, if not a little bit worse. Prospect already has a pedestrian bridge, is closer to the existing buildings, and closer to the point on the peninsula. That means if the area does grow, the station will be a shorter walk to those places. (The blue alternative is identical as the RA). Seattle Center: The Yellow looks a tiny bit better. Nice improvement, but not as important as entrances or the depth of the station. (The blue alternative is identical as the RA). South Lake Union: Sixth and Mercer looks worse than the RA. Mercer/Aurora is a car sewer, and the Gates Foundation block takes up a lot of space there. There just aren’t going to be that many people wanting to walk there. The blue alternative is a little bit better than the RA. Harrison is better than Republican, but like the Yellow alternative for the Seattle Center, the improvement is minor. Denny: The blue alternative looks much worse. It is well within walking distance of the Westlake station, which is a transfer station. This means that few people will transfer to it, which means you minimize the value of it. The yellow alternative looks about the same as the RA. Westlake: The most important issue here is the transfer. The blue alternative looks better in that regard, but the difference is so minor, and need to be worked out when they get into the fine details. I could easily see the RA working just as well (slide the station a few feet south and it essentially the same thing). Midtown: From what I can tell, the Yellow alternative moves the station closer to the existing University Station (which is worse than the blue/RA). I. D. The same as the RA, unless they dig a deep hole, then it is much worse. Stadium: Yellow alternative removes this station (the blue alternative is the same as the RA). Stadium isn’t a great station, but its better than nothing. Delridge: The most important aspect of the Delridge station is as a bus transfer point. The Yellow alternative is a little bit better (allowing the rider to get off the bus a few seconds earlier, and providing more walk up riders) while the blue alternative is much worse. As with other changes, what will ultimately matter are the details (exactly how a rider is expected to get from the bus to the train). Avalon: About the same. As with Delridge, what matters most is the transfer (although in this case, you are going to have a few more walk up riders). Alaska Junction: All about the same, although 44th (the most western of the blue alternatives) is much worse. In general that is the story. Some of the changes are a bit better, most are about the same, while others are much worse. Of course it makes sense to make the minor improvements if they don’t cost anything, or make neutral changes if they save us money. But several of the stations on the alternatives (not just Ballard and Interbay) are terrible. The gap between Westlake and Denny is excessive for a high-density area, and the southern alternative at least partly addresses it. On the other side, the northern alternatives are too close to SLU Station, especially the green one. Perhaps this post should be updated to say building a station at 15th and Dravus would be horrible for transit riders for years and years of construction. Not to mention every fright driver and other user trying to get to and from Ballard. Five years of construction compared to a hundred years of train service. Chinatown has low-budget immigrant businesses and low-income families to worry about; that’s why it’s highlighted. 15th has currently a Safeway and Walgreen’s with large surface parking lots, and some apartments, and 1970s buildings with large parking lots. What we should have done was build Forward Thrust in the 1970s, or the Bogue subway in the 1920s. Then it would be already in Ballard now and there would be no construction impact. But we didn’t, so we have to retrofit it now. Your concerns about constructed are contrasted with tens of thousands of current and future residents of the urban village being able to walk a short distance to rapid transit. That’s what non-car-dependent cities have. But that’s short term pain for long term gain. The Thorndyke station is not a good location for transit connectivity or walkability, barring the construction of a very long pedestrian bridge over BNSF’s Balmer Yard, which, given the trouble finding the $ for the Northgate ped bridge, doesn’t seem very likely. A Dravus station would allow the 32 to be improved into a Magnolia Village – U Village frequent crosstown route without making people walk a block to transfer. By “opposed by” I didn’t mean taking the opposite side but having needs that contradict it. @Mike Orr: 15th and Dravus in Interbay. Plenty of room in Ballard at the locations you’re discussing and at 17th and Dravus (“Thorndyke”). @Ron Swanson: most buses would connect to 17th and Dravus: many 2040 Magnolia buses, and SPU buses with a new connection under 15th Ave to Nickerson Street maybe I’ll put together a map on that. The 32 isn’t a thing in the KCM LRTP 2040 Service Map, but the 31 essentially still is it serves Magnolia Village. Ben, sorry, I didn’t notice the Dravus part. I’m just hyper-concerned about 15th & Market because I think it’sthe most critical issue we’re discussing. 17th and Dravus and Thorndyke are two different locations. The non-15th proposal isn’t for 17th and Dravus, it’s for Thorndyke, a block north. And that creates another Mount Baker level pointless clusterfk for transfers. You could, I guess, solve the problem by connecting Thorndyke to Nickerson, by adding a contraflow bus lane to the WB-SB ramp under the interchange, and a new intersection under there, but I wouldn’t bet on that happening ever. @Ron Swanson: the whole section of this post was about moving the station to 17th and Dravus… adding a bus lane, fixing an intersection and rebuilding Dravus Street all need to happen anyway. Just to be clear here: There is a big difference between 17th and Dravus and Thorndyke (the proposed station). They aren’t the same thing. The problem is not putting the station at 17th. 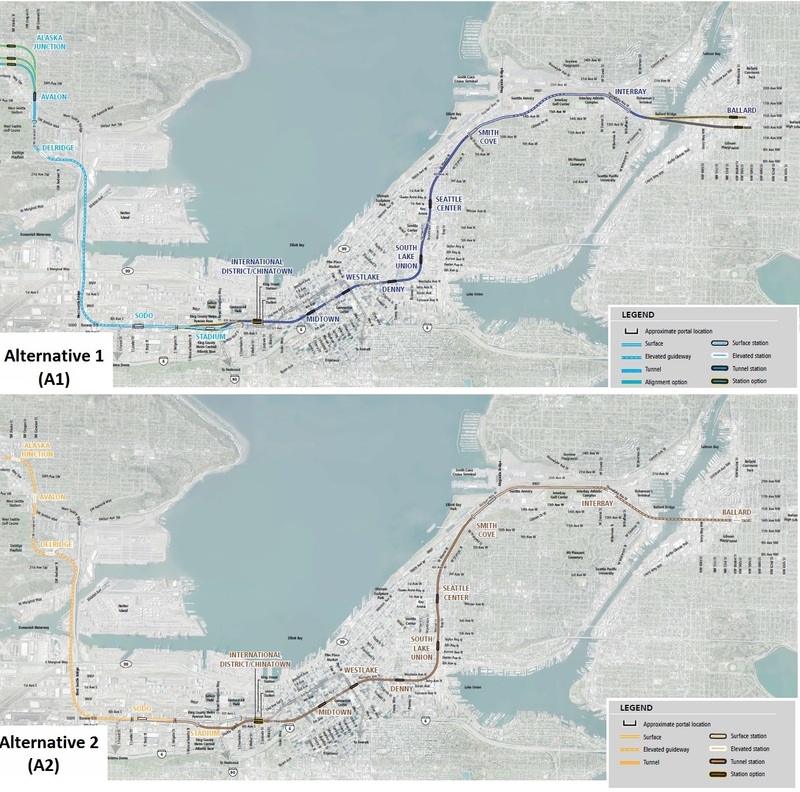 Sure, there would be some grumbling about future potential routes, as well as robbing Peter to pay Paul (west side Queen Anne loses, Magnolia wins). But overall, not worth worrying about. There is nothing fundamentally wrong with a station at 17th and Dravus. But that is not where they are proposing to build the station. They are proposing the station be on Thorndyke, which means an extra three minute walk: https://goo.gl/maps/8hz6pAT253k. It means that everyone who takes a bus from Magnolia has to cross the street and make that walk. It means that folks that walk there (from Magnolia or Queen Anne) have to walk an extra three minutes. That puts the station outside of walking distance for many (and when they ride the bus, the have to walk an extra three blocks). These things matter. You can see that with the Mount Baker Station. It seems like it would be a hugely successful station, picking up riders from the 7 and allowing them to quickly transfer to Link. But it hasn’t worked out that way, because it is just too much of a pain. The station should be on Dravus, ideally spanning it (it will, after all, be running perpendicular to it). That would make the very important bus to rail transfer painless. 17th and Dravus isn’t a realistic option, which is why ST never had it on the table. You’d have to run directly over the Interbay athletic fields and/or the golf course to make it work, which presents major 4(f) permitting issues. That’s why the station proposal is on Thorndyke – it points the track SW to go over the Keller property and onto the edge of the railyard without passing through any recreational facilities. The point (brought up ITA)is for a station to straddle Dravus more than it’s about being perfectly at 17th. Agree that Thorndyke is a weird spot to choose without direct transfers off Dravus. And I agree with straddling Dravus! Given the presence of protected parks and new multifamily in the neighborhood, all I’m saying is that the realistic options for such a station are over 20th or over 15th. And 20th doesn’t mesh with any financially realistic Ballard option. Capitol Hill Station is a warning sign. It would have been more effective under Broadway with short entrances on all four corners, rather than under Nagle Place with a grudging long southwest entrance across Broadway and no northwest entrance. And the three-block distance between the station and the Pike-Pine buses and neighborhood. I don’t know if the distance from Denny to Pine is exactly the same as 15th to 14th but it’s similar, and I have to walk past it all the time with only a long empty red-brick building along it. From the O.P. to the deep comments, everyone is saying move the station to 17th and Dravus. @Mike Orr: might be best if you clarify you’re talking about Ballard in a comment thread about Interbay station. Still, very much agreed. Even if it doesn’t straddle Dravus, as long as there is an entrance off of Dravus where the nearest train car is only a few paces away (like accessing Judkins station from Rainier or 23rd), then it should be fine. I was talking about Thorndyke too. Ross, you have not explained how the Representative Alignment avoids foreclosing a future replacement of the Ballard Bridge. It will of necessity be east of the road span, and that’s where a replacement would have to be built. Do you think that the Elected Officials aren’t thinking of that problem? Why has Seattle not brought it up then? It could have said there’s a major problem with the 15th Avenue location in that it would make it difficult to replace the bridge which they’re going to do in X year. Why didn’t Seattle say that in 2016 when the Representative Alignment was made? Seattle made noises about wanting ST to build a train+car bridge so that ST would pay for it or at least for half of it. Other than that we haven’t heard anything about when the bridge might be replaced. It would be foolish to avoid 15th if it’s a better location because it would interfere with Seattle replacing the bridge, if in fact Seattle doesn’t replace the bridge or it won’t interfere. Mike, whether the City replaces the existing bridge entirely or clones it for single-direction operation, the growth in Ballard will have to be accommodated. In fact, perhaps that’s the right way to build the RA. Add a new four lane bridge to the east with a wide bike/pedestrian pathway and the northbound track. Then nuke the walkways on the existing bridge and put three southbound lanes and the southbound track on it. Buses could share the Link trackway. There will still be buses crossing the Ship Canal to and from Ballard. I was one that argued against Ballard being part of ST3 and instead should have been part of ST4 but Ballard Subway got their way. Ballard should have been included in a comprehensive UW-Ballard, Freemont, and North Seattle plan. There were far more suitable destinations which would have required much less ridership subsidies than these last 3 stations. 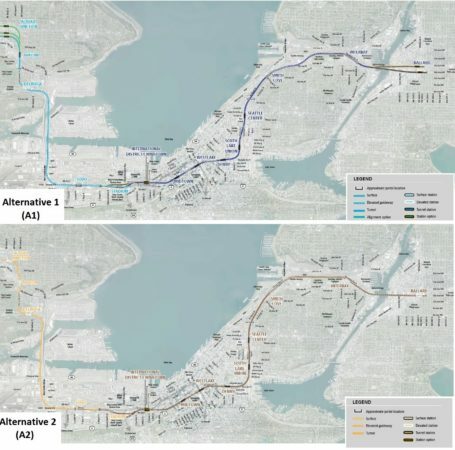 Agreed – I think there is merit in looking at the 2nd tunnel + the SLU and LQA stations as one project, and the Interbay/Ballard as a separate project than can follow a few years later, if necessary. I was one that argued against Ballard being part of ST3 and instead should have been part of ST4 but Ballard Subway got their way. So what, pray tell, should have been in ST3? West Seattle, Issaquah, Paine Field and the Tacoma Dome metro? For all of its faults, the Ballard proposal was clearly the best proposal of the bunch. It wasn’t even close. I think its short sighted to talk about Ballard of 2035 and say that 14th is not near the center of if. That location could be the very middle of the next 20 years of development. The capacity of that area to grow is much larger than any other area of Ballard. Additionally, that location opens up the option of a West Ballard station as part of a UW-Ballard line, terminating not at 14th, but someplace further west, perhaps 24th. Or perhaps terminating at a Sounder/ Water taxi location near 60th and Seaview. A station at 14th builds a future of a 2 Ballard station subway. Nope. 14th will never be a good location for this stop regardless of some additional development and relying on a Ballard/UW line for a second station that may never come is a pretty bad plan. The blue part is NEVER changing. Some areas in the walk shed could up-zone but you won’t dodge the central issue of how bad this location is for most existing people and places in Ballard. 14th and Market south to the canal looks like SLU 20 years ago. Even if it was, you have to also look towards future line expansion. Today, the remnants of the railroad line down 14th dead ends with difficult and expensive northward expansion. We need a better guarantee than “might happen”. If the upzoned 14th to 8th now to match 15th to 24th then I would have less concerns, but Seattle’s urban village strategy is to contain development in the existing urban villages with minor adjustments. That strategy has not been repealed yet; there’s no official talk of it even being a long-term possibility; nor has there been any movement to merge the Ballard-Fremont urban villages into one and fill the gap between them. And even if we did all that and 14th was built up like 15th, it would all be new buildings with wide strorefronts that would attract lifeless chain stores and price out small local businesses that pedestrians would want to go to and hang out around. Those are all near Ballard Avenue, which is a 7-block walk from 15th or a 10-block walk from 14th. And developers just haven’t been able to make new buildings as attractive to pedestrians as the old ones, except in a few restorations like the Pike Motorworks, but there are no prewar buildings on 14th to restore because they were all replaced by oversized mid-century industrial buildings. Just build it, anywhere, it doesn’t matter, because eventually it will all look like Belltown. Not that you want to serve Belltown, or any place that even look likes Belltown (that would be silly). The point is, just send trains in random directions, because the area will eventually all look like that. Sorry, but that is ridiculous. Ballard has the cultural and historical history which simply doesn’t exist in West Woodland. Nor does it have the population density, nor will it ever have the density of Ballard. If you look at the growth in the area, you can see that Ballard is adding big apartments (six, seven, eight stories high) to go along with the old three story brick ones. West Woodland is adding a handful of townhouses to go along with the industrial land it largely occupies. Those townhouses are great (we need a lot more of that in this town) but they simply don’t generate the kind of population density that exists in Ballard (or will exist in the future). Even if they allowed it in West Woodland, you aren’t likely to get a change anytime soon, if ever. Nice new townhouses are rarely converted to apartments, unless they allow much higher density (15 stories or more) and that just won’t happen. No, it makes sense to serve an area that already has people (and destinations) as opposed to just hoping that some other place will. I agree somewhat. 15th is a long, long way away from being pedestrian friendly, so a station off to either side is better than one on 15th, in my opinion. Clearly a station to the west of 15th would be more central than one east of 15th, but either is better than being on 15th. T.R., Re the blue: maybe not south of Leary, but north of there is too valuable for high rise development to leave it in chain link Hell no matter where the Link station is placed. The passengers are mostly between 15th and 24th. A station at 14th means they have to cross 15th (which you say is pedestrian-unfriendly) plus three more blocks from 15th to 14th. 15th is not that bad: a station on it would be better than making most people walk three extra blocks or transfer to an east-west bus just to get to the center of Ballard. I never thought I’d support deferring Ballard Station and the Ship Canal crossing, but this 14th Avenue alternative and the fact that both the Stakeholders Group and the Electeds Group recommended only 14th has made me start to think that. That is my argument. If they can’t build it right, they’d shouldn’t build it at all. While it would certainly be stupid not to have light rail go all the way to Ballard I’d sooner have them skip it entirely then cripple it permanently with a terrible station location. I disagree. I don’t like 14th as a station location, but it’s still much better than simply ending the line at Interbay. A “deferred” station at 17th or 20th will, in all probability, never get built. The money isn’t there, and even if the money was there, all the concerns about impacts to fisherman’s terminal and what not still apply. Meanwhile, every decade we wait, the land gets more and more built-in, and the set of parcels available for a station without demolishing 5+ story buildings gets smaller and smaller. If anything, a deferred station might end up having a location even worse than 14th. There’s the rub. We can’t repeal the tax for that segment, and it’s going be spent because West Seattle would snap it up for its tunnel. I can’t see ST deferring Ballard and just lowering the budget, not given the other factors in North King. So the result might be Link only where it’s less needed. Some of us voted for ST3 mainly for Ballard, and held our noses about West Seattle, Paine Field, Everett, Tacoma Dome, and Issaquah. If we end up with all those but not Ballard, that would be a tragic outcome. Maybe a bad out-of-the-way Ballard station is better than that. Because if we don’t build it now, is there any realistic chance that we’ll build it in a better location later? And if it’s after 2041, some of us will be dead or elderly and won’t be able to use it. 20 years ago it was known that SLU would eventually be upzoned, as had been expected for 30 years before that. The city just dragged its feet for fifty years deciding what exactly it wanted to do there. 14th is adjacent to a single-family zone, and even if it’s zoned to match 15th, the city has shown no chink of expectation or willingness to upzone the blocks east of it. Not quite. 22 years ago SLU was close to becoming a 60 acre park called The Commons, but Seattleites voted that idea down, so Paul Allen turned it in to a giant office park. I’m not suggesting Link would transform that area of Ballard (South of Market, East of 15th) into a SLU, I’m just saying the types of buildings and businesses look similar to the SLU of old. Sam. South Lake Union Historian. While the Ballard Station siting is important, it’s not as significant of an impact as bad transfers would be. Walking another block to 14th may be easy compared to some of the underground mazes with mechanical chutes and ladders at Weetlake, ID or SODO. Keep in mind too that many more riders will transfer than will use the Ballard Station in the current operations scenario. What transfers are we talking about? The 44 can just as easily stop at 14th as it can at 15th (it does in fact, or at least it used to). The light rail should essentially replace the D line where they overlap, so it is no problem for it to turn and drop passengers off one block to the east. Al, Westlake certainly might end up poorly designed, but it does not have to be. It just requires a little “outside the box” thinking. No matter if the trackway is under Fifth or Sixth, it must underrun the existing tunnel. The Westlake mezzanine doesn’t reach Sixth, but the DSTT trackway has already begun its climb from the two-and-a-half-stories depth of the platforms at Westlake by that point. There would not be vertical room for the platforms and a “T-shaped” extension of the existing mezzanine below either Sixth or Pine. Obviously it can’t overrun at Fifth because the existing mezzanine is in the way. So, the trackway will be a minimum of three and a half stories below street level. This actually gives ST the opportunity for extremely efficient cross-line transfers similar to those at the three key stations in the Washington Metro. At those stations, where the tracks cross at 90 degree angles as they will at Westlake, WMATA uses the ends of the platforms to wrap stairwells at the ends of each direction’s platforms around to a passageway directly under the platform for the upper line or over the platform for the lower line. This allows them to have a consistent station width while not reducing circulation with staircases in the crucial center of the platforms. Yes, this means that transferring riders have to walk farther on average than if the stairs were in the center of the station cross, bit it gives riders intending to transfer an incentive to board one of the cars at the end of their originating train. This results in more evenly distributed loads. For Westlake a similar design could be used, but without the long walks. The WMATA stations have full mezzanines covering the cross giving a full block’s access to the station in each of the cardinal directions. If the Green Line tunnel follows Fifth all the way to Pine, the same sort of “X” shaped mezzanine could be added to the existing one, though it wouldn’t be exactly symmetrical as are WMATA’s. If the trackway does the RA “wiggle” to Sixth by Pine, the existing mezzanine can have a “T” crossbar added to it, perhaps with a passageway under Pine to the Convention Center. No matter this mooted passageway, though, the secret sauce would two short, fare-paid “mini-” or “half-mezzanines” sticking out from the existing platforms far enough to accommodate escalators from the cross-bar of the new mezzanine and wide enough that two up and two down escalators can all be side be side with an additional passage on the west side of the escalator banks for access to stairs leading both up and down as well. The escalators would begin at the outer ends of the cross-bars in order to capture walkers from as far as Pike and Olive Way and lead them directly to the half-mezzanines and one of the existing platforms. The bank leading down to a wide center platform would go back outward, spreading the riders toward the ends if the trains, leaving the middles of trains for single-line riders. It’s 3 extra blocks, not one. And it would be much worse for riders even than bad transfers. Funny, I’ve seen more change in the ‘blue’ that is ‘never’ changing in the last 5 years than in most places in the city. More retail, more office. The MHA rezone just went through tackling some of the SF zone to the north. This is just beginning. Perhaps I’m too optimistic. Also, are you really making an ‘existing people’ argument? Absolutely not. I’m pointing out that industrial interests win these battles. Throwing in some brewpubs that limbo under that line isn’t the same as adding apartments. On the same subject — what year are we in on the Missing Link project? That’s only industrial-adjacent. Some brewpubs? Come on man. A Trader Joe’s, 24-hour fitness, daycare, restaurants, at least a couple other grocery stores, a bunch of offices, and even some housing. Not just some brewpubs. When I read the first paragraph about planning for riders first, I was inspired and hopeful about the article. Alas, that message doesn’t carry through the article specifics very well. Change the terminology and presentation: the maps are showing platform locations, not stations. The way that riders get in and out of stations is very important. I worry that — despite the hundreds of comments about this — it’s not clear how much these alternatives affect conceptual station layouts and costs. A horrible layout can both make station costs astronomical and be a huge burden to decades of riders. Layout is a three-dimensional problem too; it’s bigger than just the two-dimensions shown on a map. I fear that in a move to appease finding money to please neighbors, ST alternatives will not propose good layouts and riders will be forced to accept horrible stations. If West Seattle can get $700m more tunnel options on the table, why can’t we get a $700m exit tunnel from Midtown Station to First Hill on the table? Demand removing the deep tunnel options at ID: The deep tunnel has to be the worst idea yet to come out of the alternatives. While advocating for the 5th shallow station as the superior choice is great, I was hoping to read a more forceful condemnation of the deep Station idea. The elected officials need to fear the repeated wrath of riders/ voters if they want to keep the deep tunnel on the table! Transfer stations: the proposed operation will require tens of thousands of rail-rail transfers in the future. Having stations designed to have cross-platform transfers is ideal, and only one level change of under 30 feet is the next best change. There is no attempt to have an intentional cross-platform alternative in any of these. It’s as if transfers don’t matter to ST, and ST needs to be called out on this! Rider advocates should demand that either ST do transfer stations well, or rethink the operations to blend and branch lines. So, is Seattle Subway going to stay in this “reactive” mode or is Seattle Subway going to take the lead in demanding a major attitude adjustment about how these alternatives are already ignoring the practical future realities for riders? Hear, hear! STB needs to say repeatedly in the headlines between now and the final EIS that cross-platform train-to-train transfers and nixing the 14th Avenue alternatives are the two most critical aspects of ST3 Link. Couldn’t agree more with cross-platform transfers. Transit planning in Seattle is a total joke. Where is the vision (as if it even really requires that)? There is only one place in the currently planned ST system where there could be “cross-platform” transfers, at least not without a major rebuild of IDS or building parallel stacked structures for the Red and Green Lines at SoDo. If Bellevue TC station had been built with a center platform, it would have been the best transfer opportunity in the system, with efficient in- and out of-direction changes. Even with side platforms it will be excellent for in-direction transfers (Overlake-Issaquah and Kirkland Seattle). IIRC, East Main may be center-platform and can serve that purpose for Issaquah-Seattle trips. Westlake could never be “cross-platform” because the lines cross at 90 degrees. IDS in its current configuration can’t either because you can’t have one track of the Green Line on each side because the western track would have to underrun the existing tunnel and can’t rise to a shared platform level that rapidly. Intl Dist should be rebuilt to correct the mistake of side platforms. Station entrance locations are critical – along with transfers possibly the most critical aspect of the system design. I don’t know if the “stakeholders” have ever thought of anything save a one-seat ride from wherever they are to wherever they work, but if we are building a SYSTEM somebody damn sure needs to start looking at these things and fiercely defending them. I often wonder how many of these folks have ever ridden systems anywhere else to see how they work. Clearly too many station placements indicate that they have not. ST seems to see these as commuter trains rather than a metro system; it tries too hard to be both, but based on frequency and service at least in the urban area it is much more a pre-metro than commuter lines. Urban station separation and design must take that into account. The stakeholders aren’t chosen on the basis of being transit experts or being curious about systems in other cities. They’re chosen for being representative members of the community. There might be one transit fan for well-roundedness, but apparently in this case there wasn’t, or the person wasn’t able to overcome the “don’t disrupt me” or “port jobs” arguments. I applied for a Metro review board once and wasn’t chosen, I think because they were looking for a minority representative or there were already a transit fan on the board or they were afraid everyone would just defer to my opinion because I knew a lot about transit. This is why we need a specifically riders’ review board. Riders are the ones who can say whether a proposal meets its primary goal of overall mobility. We do need a riders’ review board but they will have little additional useful input other than what their own commute or travel patterns cover. Somebody or entity will need to give the lay rider a framework to base their decisions on for future travel. What we need is transit planning expertise – that we either don’t have or haven’t listened to in ST’s case – to design and explain potential transit futures as Metro has already done in the LRPs. That information can then be presented to the lay community. You yourself have done this very well on multiple occasions with your knowledge of Metro’s future plans, explaining to others on this very board what’s intended to come next. Yet we have absolutely no indication that ST has even considered that in their station designs and locations – in fact, the evidence to date strongly suggests that they haven’t. Metro neither designs or locates the stations; all they can do is react to the general location the stations will be at. ST is the agency placing the stations and should be obligated to design them accordingly. Metro (PT, CT, etc.) can’t move the roads. It is clear that specifically in ST’s case they don’t have – or worse, have ignored – any level of expertise that would have told them that stations at NE 148th instead of 145th, or a block south of 45th, or half a mile from the main E-W street at Northgate, or would even come up with a deep level transfer at ID Station as a viable option are poor, poor design decisions for a functioning network. No transit user on a riders’ board who takes the 550 from Bellevue to downtown is going to even think about how she would transfer at ID Station, because she isn’t going to transfer at ID Station. The elevators for deep stations in London have much higher capacity and separate in and out doors. Also it’s unnecessary to press buttons, the elevators just run continuously. I think that addresses the extra distance necessarily to get in and out well. The benefit of deep stations (like Husky Stadium and the two new stations and the Ave and 65th) is the construction impact is much lower than when they tore up 3rd Ave to build the bus tunnel back in the 80s. Shouldn’t the Ballard station be in the ‘downtown’ core of Ballard? These options seem more Ballard adjacent. A station that doesn’t have a subway entrance at Leary and Market in that corner park is pointless, IMHO. If it’s elevated, I guess I see the value of a more far flung locale (as in not destroying what makes Ballard Seattle’s most charming neighborhood). But, at this point, you might as well just put it in the Fred Meyer parking lot to unmaximize potential awesomeness. Not necessarily. By placing the station “ballard adjacent” allows for the station to serve the newer, denser developments while keeping the historic core still within walking distance. As Ballard grows, there will be more people & job in the 6~8 story buildings surrounding 15ht & Market than in the 2~4 story building in historic ballard. Even if Leary & Market is the cultural center of the neighborhood, that doesn’t make it the best logistical node. Towns & neighborhoods grow & stretch as transportation infrastructure is put in. In East King, the commercial activity centers for Kirkland, Bellevue, and Issaquah are all a solid 10~20 minute walk from their historic downtowns, and for Redmond the Overlake neighborhood, where most of Redmond’s job are, if quite far from the “center” of Redmond. Dude, the newer, denser development is too the west! It isn’t even close. Almost all the big buildings are built to the west, while the areas to the east are townhouses. Nothing wrong with townhouses, but they are smaller. They are like the crappy old duplexes built in Ballard 40 years ago. Except unlike those duplexes, they are nice, and thus worth a lot of money. They won’t be replaced anytime soon (if ever) even if the area is rezoned. Add in the industrial area, and it is clear: West Woodland will never, ever catch up with Ballard in terms of population density, no matter where they put the station. Ballard’s development is in a Y shape. 15th is the six-lane road that goes straight north, while Leary Way leads to a dead end for an elevated line. That was the long-term reason for favoring 15th (although I wouldn’t have). The short-term reason is that 15th has underused space for new development, and the alignment is primarily oriented to serve those. If ST had come in with a design that was always a subway then yes it should have had a underground station farther into the ‘old’ Ballard core. But since they went for a cheaper above ground design that meant ‘old’ Ballard was always out of the picture. With that in mind 15th makes the most sense, since it immediately connects up with the current bus lines and provides a clear path for the line to be extended ever northward in future projects. Frankly in my mind if all they are willing to do is a station at 14th I’d rather they didn’t spend the money at all. Your first paragraph is spot on. What baffles me is why people just assume that because they put in a couple big buildings at 15th and Market that suddenly that is the epicenter of development. It isn’t even close. 24th and Market has way more big buildings within a five minute walk, despite being close to the water. Which makes the logical location for walk up riders somewhere close to there. But since the plan was to build this elevated, then 15th is the best option. As for whether we should just abandon the whole thing — I’m ambivalent. I’d rather see a line up 24th than one up 15th, other than the fact that the high school is on 15th…high schoolers can walk 9 blocks though. Of course, there is nothing to ruin on 15th since it is already ugly, noisy, and very pedestrian unfriendly, so if the line is going to be elevated, perhaps that is a better route. I think this discussion has to rapidly lose the idea that “stakeholders” (do they have to bring their own torches and pitchforks too? Wait a minute, wrong monster. Should be crucifixes and sanctified pizza) and passengers are different groups of people. System should be designed from the beginning to so everybody along its route sees more benefit than discomfort out of it. Greatly assisted by deliberately writing as much flexibility as possible into the design of structures, vehicles, operation, and rolling stock. Not sure if “Future Proofing” means building to survive unforeseen future problems, or to make sure they can’t be fixed. Does STB have an editorial preference for that one? In addition to people’s needs in areas like residence and work….think the Dutch run trains underwater through tethered floating tubes. On late 19th century maps, Jackson Street was beach front property along a lagoon. Well, one present from DSTT past to future wetter-warmer days. Around Fifth and Madison, I-5 will be world’s most needed drain. ‘Tis an ill wind that drowns absolutely everybody. Yes, but that’s not the political structure we have. Power rests in city government units, not in pedestrian concentrations. The “stakeholders” are those governments, large businesses, large institutions, and representatives of minority and disabled groups. The whole trend of US power over the last half-century has been toward “local control” in small suburban municipalities, which precludes having a technocratic “best overall transit” plan like in Canada or Germany, where trunk transit is put where it can be the most effective and the most people can use it. That’s a passengers-first approach. But instead we have to do what every city government wants even if what it wants is not as good for the most transit riders. We need a thorough overhaul of state/ST/city authority structures and tax structures to fix this, and a transportation czar (state and/or regional) that really prioritized transit and transit best practices. The point is, you can’t just say the current councilmembers and ST board should do this, because they won’t. You can’t just change the stakeholder structure that easily. It should be easier to get a Riders’ Advisory Board established, as some here have suggested, because that doesn’t shrink the power of any of the current power centers. But even a riders’ board is an uphill battle with ST. The best we can do (STB, Seattle Subway, and the Transit Riders’ Union) is to be an unofficial riders’ review board. How much effort has anybody made to cure this division? A few small groups- knowledge and perspective more important than size of group. Remember, all these power centers probably ripped each other to shreds in their struggle for power. If we’re lucky, we can become a formidable power center ourselves and cause hundreds of needless delays and conflicts. These things take time though. Curing the division would require them to actually use the system they’re designing, and mandating that they use public transit when they travel daily would probably be harder to make happen than getting pedestrian-friendly infrastructure in Bellevue. The subway is about more sustainable Real Estate development. Find a way to build more density as an alternative to freeways and cul-de-sacs on Mt Rainier. Expand our metro more like Munich and less like Los Angeles. So if all development stopped forever we wouldn’t need a subway? What about existing residents? Do you think the C, D, E, 40, and 512 are just fine and we don’t need anything more? Yeah. That’s straight up maddening. Hopefully the board finds a way to pick something better, but it seems like they are locked into this BS, otherwise it wouldn’t keep rearing its ugly head in these plans. The board has not spoken about 14th. The board just told staff to gather public and stakeholder input, and that’s what it’s doing. One of the other things I think I can infer in A1/A2 vs the RA for SODO is some sort of grade separation for the Lander and Holgate crossings. I think those will create an underappreciated increase in speed and reliability. Holgate in particular seems to consistently have stumbling pedestrians milling about the crossing that must give operators white hair. Yep. Link is crazy slow through there. Those crossings will hopefully allow Link to move at regular subway speed. The city of Seattle is already building an overpass for Lander St. over the BNSF tracks, which I assume, will pass over the Link tracks, also – otherwise, the approaches would be too steep. That leaves only Holgate. For everyone making comments about the Interbay stop location. Please do not use Dravus street as your only reference point. That street goes East/West and the proposals for stations covered its entire length from the base of Magnolia hill to the west to the base of Queen Anne to the east. Please reference the cross street as well so we know which side (east/west) you are talking about. The Thorndyke street which is clearly the one they’ve chosen is essentially in the middle. It’s also very easy to extend bus service for the 31/32 to that location. There is a section of road that can be connected from the W. Nickerson to 15th street interchange at minimal expense directly to Thorndyke. Look it up on a map, Thorndyke literally terminates about 100-200ft from W. Nickerson/15th. Dravus is the primary reference points because some stop, on Dravus, makes the most sense. Where on Dravus? Doesn’t make that much difference. Really, it doesn’t. If someone wants to create some diamonds and do the analysis, then I would happy to be corrected. But for the most part, if you move the station to the east, you pick up more walk-up riders from Queen Anne, but lose them from Magnolia. If you move the station further west, you do the opposite. But here is the kicker: If you move the station to Thorndyke (between Bertona and 16th), you lose them from both. That is because the only way to access that stop (from either side) is via Dravus. That is the only way to cross the railroad tracks or 15th. So that extra walking is endured by both parties. Meanwhile, the bus to train transfer is worse. Yes, you could mitigate the problem by doing what you suggest, but if it was really that easy to do, it probably would have been done years ago. It would certainly help relieve congestion on 15th and Dravus. But instead Seattle is focused on more important things, like replacing the Magnolia Bridge (which will go in south of Dravus, not north). Oh, and exactly how is a northbound vehicle supposed to tie into the thing? In other words, how is a bus supposed to get from 20th and Dravus to 12th and Nickerson in your futuristic world? Is there supposed to be a tunnel under there? But even if that back route to Thorndyke was built, you leave out a significant number or potential riders. Imagine you are living in the Belvedere Apartments, and were expecting an easy five minute walk to the station (not counting the extra walk up to the platform): https://goo.gl/maps/UUHA6uWJWLJ2. Now it is 12 minutes (https://goo.gl/maps/muAPQEP5dPA2) way too long for a lot of people. With your proposed bus route, instead of being five minutes away from the existing bus stop, you are about ten minutes away from a connecting train that will get you to downtown (https://goo.gl/maps/fzxHppvJRqG2). You are in no man’s land. It takes you twice as long to walk to a bus that will get you to the U-District, and twice as along to get to a bus that will connect you to a train that will get you to downtown. You are, clearly, worse off. You aren’t alone. Call me crazy, but it really doesn’t make sense to spend billions of dollars on a transit system, and make things worse for the folks that are within a few hundred feet of the station. If the Magnolia Bridge isn’t replaced, Dravus becomes the easy-west route for most buses to Magnolia. Diverting them north to the station to go south back to Dravus would be a huge mistake. A lot of the problems with the Thorndyke Option stems from the fact that it locates the station several minutes’ walk north of Dravus, yet the only way to cross the highway monstrosity of 15th is Dravus, forcing a north/south backtrack to get between the station and parts of Queen Anne. That, and putting the station right up against the BNSF railroad tracks, again, with no way to cross, means no good walkshed from the west either. A pedestrian bridge that would make Bertona go through for foot traffic, all the way from Queen Anne to Magnolia would address these concerns. Such a bridge would not be cheap, but without it, the station feels almost pointless. I guess you could send the 31 there, but then you’d lose access to fisherman’s terminal, and a good chunk of NE Magnolia. A gondola from the Ballard Link station to 24th to ‘downtown’ magnolia to Smith Cove up to Queen Anne down to SPU and back to the Ballard Link station. The ‘downtown’ in qoutes is why it’s too low density for a gondola. Magnolia was offered a choice: accept an upzone or get no transit upgrades. It chose the latter. If we’re going to spend money on a gondola, it should be where the biggest need is, which is Denny Way, or maybe James Street. The Dravus station has a horrible walkshed based on hills alone. Both from Queen Anne and Magnolia. But what it has is Magnolia bus integration (after the Magnolia Bridge closes) and the 32/31 integration. Ross B is still wrong about that people will want walk from West Queen Anne or East Magnolia apartments. It should go without saying that the whole point of expanding Link is to serve future riders, their needs should be the first and last consideration before any route is chosen. Sounds like the same argument used to bulldoze neighborhoods to build freeways. The fundamental problem with ST however remains the structure of the board; appointed politicians. That’s how we ended up with a torturous tunnel-ette in DT Bellevue that spares no expense in avoiding any impact on the City Hall parking garage. Until the fundamental structure of how ST is governed gets changed it’s just doing the same old thing and expecting a different result. The sentence was ambiguously worded. The riders are already there. The reason to expand Link to Ballard is to serve the existing urban village that can’t reach its potential without high-capacity transit. They are “future” riders only in the sense that they can’t ride it until it opens. There’s also another sense of “future riders”: people who don’t live there yet but will live in the new apartments. That is not the purpose of Link as far as I’m concerned. A well-functioning city needs to have trunk transit connecting the existing dense areas that have proven themselves for a century, and not go speculating about “future riders” that may or may not pan out. The target market is the current riders of the 40 and D south of 65th, to give them faster, more reliable, more frequent service. Why? So that they can more effectively do their errands and contribute to the city’s economic/cultural/social life and be more healthy. They’re the core of the anticipated Link service. The people in the new buildings can add to that core, and hopefully people who really want to live near Link and will ride it a lot will move into those buildings, grateful that they finally have more opportunities to live near a station. The second reason for freeways through neighborhoods, this case downtown, was a fear that the downtown business districts would die without them because they couldn’t compete with the suburban malls. This wasn’t as strong a factor in Seattle, but it was in other cities where Main Street had emptied further. The third reason was a belief that the neighborhoods were blighted and needed to be rebuilt from scratch. Those were the same neighborhoods that were redlined and had a lot of minorities. In fact it’s proven now that it was the presence of minorities that caused them to be redlined, the redlining blocked bank mortgages and prevented the residents from maintaining the buildings, and that’s why they looked blighted and in need of an overhaul. So the freeways and urban renewal were going to sweep all that away and bring back higher-income (white) residents, Or if it didn’t (because the freeways were really noisy and created a lot of no-man’s-land around them), it wouldn’t mater much because it was “drive through” area anyway (between the flourishing new suburban neighborhoods and downtown). This is what the Thompson Freeway would have done (as well as wiping out the Arboretum). And rapid transit played a less-than-stellar role too, as the Forward Thrust map called the Central District station area “Model Neighborhood”, implying it would be rebuilt into something more model. How should we change the structure of Sound Transit? It’s actually happening, which is objectively better than every other attempt at building transit. The car dealerships, oil industry and their GOP friends (especially on KIRO/KVI/Seattle Times) won’t stop until Sound Transit is shut down and the trains sold for scrap. The only talking points I’ve heard advocating changing the structure of ST originates from political agents that are fundamentally opposed to transit expansion in any form. I could blow out the world’s link server if I keep linking same thing for a thousand years. Try only to do that when I think I’ve got an audience that really needs it. like for instance some young SDOT staffers that don’t realize what trolleybuses and streetcars have actually done in the world. What are the chances their travel agent will accidentally put on them Aeroflot (do the Russians still call it that?) and as they get off the plane in Yalta without either Russian or Ukrainian, they get on the fifty mile long trolleybus line to the capital. And still think they’re going to Queen Anne Hill, but same high quality experience. And that great little grip car pushing those giant Austo Hungarian Empire streetcars straight up the side of a building. Drivers very likely favor whale restoration- especially if they’re from Murmansk. So ORCA card will work just fine, even if you forget to tap off. So for same reason, there’s a great people mover at Oakland Airport that runs several miles gripping a pretty silver cable. Cars themselves look like Airstream trailers. Point being that, argue long enough about 14th or 15th, both sides decide station along north side of the canal from Ballard to Husky Stadium because it’ll cost less than twenty more years fighting about it. Will pull Market Street hill up to Phinney ridge. From personal experience in Africa, can testify that monkeys love to go for rides, so passenger count will always justify service. The futurist in me sees lots of West Seattle, Ballard, Magnolia and Queen Anne as candidate neighborhoods for slow-moving, almost on-demand driverless vehicles to take people to and from Link. After all, we are looking at a 2035 opening date and I think it may be even a longer wait for opening day. However, a rail-rail transfer has no easy technology solution. That’s one more reason that I see to raise the issue that’s most critical to design well is for rail line transfers. If the driverless vehicles are on-demand, they will certainly be slow moving because the streets will be choked with circling, unoccupied vehicles. But yes, chunks of those neighborhoods would be well served by low capacity transit that connects riders to nearby Link stations. Magnolia or Queen Anne might be a good test bed for driverless cars. Magnolia is dead-end so there’s no high-speed through traffic. Most of the streets are two-lane residential with little traffic, and it would be relatively easy to teach it how to behave on two short arterials to stations on15th. The residents might even agree to cooperate with the company to help it map out the hazards and get training on what its weaknesses are so they can minimize hazardous situations and keep their children safe. I meant driverless taxis, not driverless personal cars. The last thing we need to do is subsidize or pilot driverless personal cars so that the haves have them and the have-nots don’t. The only personal cars that are possibly worth subsidizing are zero-emission cars or cars for the disabled. I really wish we weren’t acting like having private taxis/TNCs as an integral part of our public transit system is in any way a good idea. My vision is last-mile taxis in limited service areas, in places where fixed routes aren’t feasible or would serve too small a percentage of houses. Metro could either run it or contact it out, but the fare would be comparable to the bus and it would accept ORCA transfers. Driverless vehicles can be implemented by public transport agencies. It doesn’t have to be private. However, most of the history of pre-1970 transit systems is as private companies. Private companies originally built many of the wonderful urban rail systems we have in the US (with publicly-funded modernization, of course). I wouldn’t be too focused on who owns and operates last-mile driverless transit, and instead look at is as an emerging urban transit systems design that fits well in lower-density hillside residential areas when connected to sufficiently-spaced urban rail stations. West Woodland? Come on, 14th is Ballard. West Woodland would be between 3rd and Phinney. And no, 14th is not 3 blocks from 15th. 15th and Market is a major thoroughfare for traffic, no need to muck it up with a light rail station, think Roosevelt station next to 65th and Roosevelt. Who are you responsing to? Adams the sub-neighborhood name of central Ballard. Regarding three blocks, it’s definitely three short blocks between 14th and 15th. Open up Google maps and eyeball it vs blocks just north of there. Blocks are subjective, but the point is it’s a significant distance for pedestrians: Particularly pedestrians who are already walking from all the apartments on 24th. A bigger deal than the distance is the barrier of 15th NW itself. A station shouldn’t force thousands of additional people to cross that busy street. There should be a direct connection from the station to either side of the street. Historically West Woodland was considered to extend west only to 8th Avenue, and this really is the appropriate definition. Not sure why the city decided to expand the definition. Even growing up east of 8th ave, I never once considered myself to live in Weat Woodland and never heard anyone refer to the area that way. These are census-block designations, not cultural neighborhoods. The cultural neighborhoods are Ballard, Fremont, and maybe Phinney. While I agree that the rider experience should be the first and most significant consideration, I strongly disagree that it should be the last. While we’re on this subject, is anyone else as upset as me that the line runs along I-5 north and south of Seattle instead of along 99? I don’t think I’ve seen this discussed but it seems so obvious to me. A route along I-5 dooms the system to be mostly car (and less so bus) fed rather than being walkable. Everything that anyone would want to get to is on 99, not I-5, which is the most uninviting, unwalkable, and non-dense route possible along most of its length. The route should probably cut over to I-5 along 524, but then should come back to 99 until it gets to Everett. I get that I-5 is cheaper…but is it better to buy a cheap, useless thing than a more expensive, but actually useful thing? Did anybody say it should be the last (i.e., only) consideration? Any piece of infrastructure is part of an environment/community, and that raises multiple diverse issues. Rider experience is foremost because that’s the purpose of transit: to get people where they want to go in the most convenient way. Connecting the areas with the largest pedestrian concentrations is a corollary because that’s how you convenience the most people. Serving lower-income areas is another important consideration. Having unobtrusive structures that don’t create a no-man’s-land around them is another consideration (although not completely achievable because stanchions need a minimum footprint to hold the weight of the train given current technology). There are doubtless others. We’ve discussed this many, many times. If we’re quiet now it’s because we’re exhausted and it’s futile because ST has already decided it won’t. We wrote hundreds of feedbacks and participated in open houses and testified at ST hearings to get Link on Aurora and Pacific Avenue South, but we were unable to overcome the objections. We also argued for 99 in Snohomish and Pierce Counties. In Pierce it might have a chance because both the 99 and I-5 options are still live, Five asked for 99 and promised a dense downtown, some other community members asked for 99, and the travel time and cost are the same, A few people are arguing for I-5 for reasons I don’t remember. In Snohomish County, we argued for 99 but didn’t put a lot of effort into it because 99 is a basket case up there with mostly car dealerships and little hope it might be upzoned. Everett argued against 99+Evergreen Way because it said they’re perfect right now. (That vaguely echoes Tukwila’s objection in the 1990s, that it had just beautified Tukwila International Blvd and didn’t want it ripped up again.) And Snohomish and its cities are adamant that Link must have the Paine Field arc because it’s the county’s largest jobs center. The Paine Field arc is expensive, so they want the rest of Link on I-5 to save money for it. The region missed a huge opportunity for stations on 99 and Pacific Highway where lots of housing could be built within walking distance, it’s a lower-cost area because of 99’s historical reputation, and there are no single-family houses along it to be offended. That’s tens of thousands of people who could have lived there, but no. I myself take a sort of sadistic pleasure in listening to people complain about the traffic on the I-405 corridor, although I try not to show it. Serves them right. and that stupid BRT system, too.